Living in a hole in the ground and living of the earth is nothing strange for a hobbit. 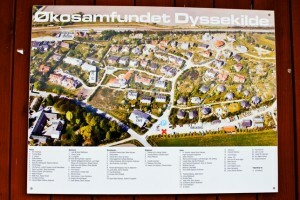 Now in Denmark there’s a eco-friendy spin on the concept with a Shire-like village. About an hour and a half by train from Copenhagen the eco-village has 74 sustainably-designed highly unique houses and apartment buildings that range from hobbit-style straw bale to high design. The site also includes seven wind turbines, an impressive 66-foot-long bin system for recycling, chickens, gardens, and acres of green space -— all serving 118 people, 60 of which are children.